David Brooks says international allegiance must be a personal choice as he prepares to commit to Wales. Brooks has won three caps for Wales since representing England Under-20s, but all of those have been friendlies. But the 21-year-old is set to seal his Wales future with a competitive debut against the Republic of Ireland in the Nations League on Thursday. "I won't be switching even if I don't get on (against the Republic)," said the Bournemouth midfielder. Brooks comments come as West Ham defender Declan Rice considers whether to seek a future with England, despite playing in three Republic of Ireland friendlies. "You can get all the advice in the world, but if you want to do something for yourself you have to [make a decision] for yourself," Brooks added. Republic manager Martin O'Neill has left London-born Rice out of the squad to face Wales in Cardiff after admitting the 19-year-old is weighing up an offer to switch to England. 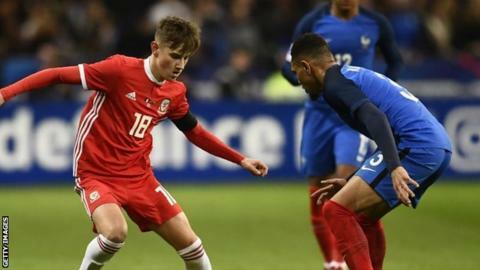 Brooks, whose mother is from Llangollen in North Wales, says his decision to commit to Wales was "an easy one" despite having played for England in last year's Toulon Tournament. The 21-year-old won his first senior cap for Wales in October 2017 against France in Paris, previously admitting his mother cried with pride as he made his debut. He went on to feature against Panama a few days later in Chris Coleman's final game in charge before playing against Mexico in June under new manager Ryan Giggs. Aware of the form that earned him a £10m move to the Premier League from Sheffield United this summer, supporters have been eager for Brooks to make a competitive appearance to end any remaining speculation around his dual-qualification. But Brooks has allayed any lingering fears over his future, saying he is excited about being part of Giggs' plans. "It will be just nice to get the Wales shirt on again," Brooks said. "I've said before the England [Under-20] call-up, I'd expressed my feelings to play for Wales and thankfully it came about I could do so. "There is a decision to be made for all younger players like Declan Rice and myself. "I don't know his situation and what he wants to do so I can't really comment on that, but for me it was always going to be Wales and thankfully I got that opportunity. "The quality in our squad is there for all to see. Playing with them is only going to make my game better and I'm looking forward to it." Along with Chelsea's Ethan Ampadu and Liverpool's Ben Woodburn, Brooks is one of several young talents in Giggs' ranks as the former Manchester United icon also prepares for his first competitive game since taking charge in January. "In the last couple of matches and training camps we've had, there's been an element of youth in there, people have got their chance," said Brooks. "As a young players you look at it and know if you're good enough you will get an opportunity and that's great for Wales going forward. "I'm a big Man Utd fan and watching (Giggs) growing up he was a fantastic player and he's near enough won every trophy under the sun. If he's got any advice for me I'll be glad to take it on board."